I’m setting up another Vehicle-Bag/Stuff for a Jeep I just got. Among all the normal items, a million lists out there, I needed a new “Folding Shovel”. 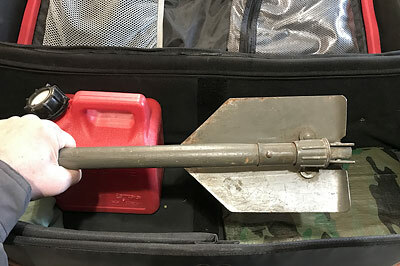 One of the old military style shovels that can be stored in a small area (jeep is a small vehicle). 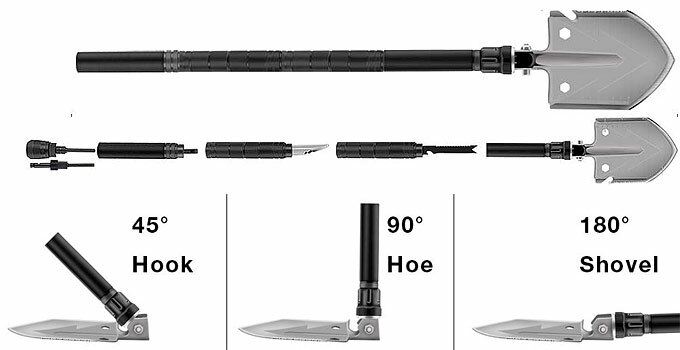 Ok, the item is a “Military Portable Folding Survival Shovel” with waist pack for Camping, Hiking, Backpacking, Fishing, Tactical, Trench Entrenching Tool, Car Emergency Snow Removal… on Amazon for right around $30. I was skeptical when I ordered it, and said sure; here we go with a cheap hunk of Chinese JUNK! So if I did not like it, I would send it back. Gotta love Amazon for that. I’m not going into all the stuff it has and can do (go to the link and look see). But I really REALLY like this puppy (I mean, folding shovel). And what’s really nice is it disassembles down into a small (approx.) 2”x10”x8” case; absolutely perfect for the Jeep. I mean this thing has everything from a Magnesium Rod (fire starter) to a Beer Bottle Opener (MOST IMPORTANT). AND is very well built, well machined and everything actually “Fits”. Check these out, tis very nice to have, I was extremely impressed. Ok, done, a short review. If you’re in need of a folding shovel, this sucker is Sharp, literally SHARP. Don’t cut yourself it really has many Sharp Edges for cutting! [Ken adds: ] A folding shovel is a nice piece of survival gear to have. There are LOTS to pick from. Some are designed multi functional. Some are just plain folding shovels (which is what I currently have). It’s a pretty basic tool (a shovel!). But it can be an important one for all sorts of tasks – or ordinary camping (tent trench!) – or whatever else. Mrs.J and I, and another couple (neighbor friends) planned a weekend camping trip to a state park that we liked. As it turned out, when we got there that afternoon it was POURING RAIN. And I mean buckets… However we were not going to let that ruin our fun. We put on our rain gear and set up the tents, a canopy for the picnic table, and other tarps strung to trees for further protection. We were all soaked to the core the first evening during setup and till wee hours of the morning. We had the greatest time during that storm (thunder & lightning too). Maybe it was the Brandy 😉 but we’ll never forget that weekend. P.S. I keep a folding shovel in my truck kit, and one in my ATV kit. P.S.S. (This particular Entrenching Shovel) is very popular. Other uses for a folding shovel? Nice shovel, like the extendable handle, added to the list of things. Currently have a folding one similar to Ken’s. Fits in my big bag; good for- digging snow if stuck (bag of kitty litter in the truck bed), spreading sand from the two 5 gallon buckets i also have in the truck, digging a hole to bury something that attract scroungers and 2 or 4 legged predators, good for doing the “el-kabong” if necessary. I like ’em, but lately my favorite has been an inexpensive one piece shovel made by Cold Steel, with a stout wooden handle about 16″ long. I’m sure you can get them on Ken’s Amazon store. It will not only dig, but since the blade is sharpened you can also cut wood with it! Modeled after the Russian Speznaz (special Forces) shovel, it really works for me. Its just a bit heavier than the GI folding one, but it now resides in the pannier for my get-home bicycle so the weight difference is irrelevant. A very good tool to have in your vehicle, compact,versatile and it doesn’t break the bank.If you are into hiking, it is also a must have tool in my book . – I have one like Ken’s in each of the vehicles, and one with the folding pick in with my dutch ovens. The pick makes a decent lid lifter for the oven. In addition, I have an issue Aames trifold in the O.D. rubber carrier which lives on the outside if my ALICE BOB rucksack. The only thing absolutely common to all of them is they are all American Made. Yes, I believe in them. I use them all regularly, too. Just ordered one through Ken’s site for my little wife, hope she likes it. …and I ordered one for my son’s birthday. Wow, I also keep the wooden handled folder in my car and the trifolder in my BOB. I got the trifolder back when in the military. It is sturdy not like some of those el cheapos out there. I saw one of those multi segment shovels in an article a while back. My biggest worry about it are all the segments which can be breaking points. All the gadgets are nice but if it doesnt do the one thing that it is supposed to do well, which is dig, then I’ll stick with the old trustys. Then again I could be wrong as I have not yet tried it out, yet. I can vouch for the trifold and wooden handled as I used the trifold in the military and the wooden was used to dig many foxholes in a nearby woods when I was a little kid. Yes, ordered this for us via Ken’s site, have to keep him in business and out of trouble with Mrs. J.
HAHAHAHA Ain’t going to happen. A C. How about I get snake eater a replacement GI one for his birthday ,,????? 1. How rugged/sturdy would you say it is when assembled? I’ve had issues with tools that have to be assembled for use being too weak to actually be used. I’ve got my old military tri fold but it just resides in a go box. After many years I’ve decided to keep full size in the truck, camper etc. the labor vs space savings just ain’t worth it no more. I needs shovel in this red clay, snow etc I want a full size one. I would, personally, suggest the application to NOALOX, by Ideal, to keep the handle segments from becoming one piece. The NOALOX prevents galling and seizing of aluminum to aluminum joints. Is under $6 for a 4 oz. bottle at the orange box/bucket store. Weather (rain-snow-whatever) doesn’t seem to wash this stuff off. I have had this applied to antenna parts that have been in the air for over 5 years and they come apart, when one needs to take them apart, easily. In a previous life, this stuff was supplied with antennas for various gov’t/mil projects. For some reason it seemed to ‘disappear’ shortly after receiving the project shipment. We had to send replacements quite often. I got one of those GI folders also. Painted Army green, of course. Works for me, but I only have mine 45 years. Still looks good though. The most popular addition to the older wood handled one was a file. All edges filed sharp and if it came down to hand to hand encounters you had a makeshift battle axe. Try doing that with a trifold.